Spark for the future: with the Mission E Cross Turismo, Porsche will be unveiling the concept study of an electrically driven cross utility vehicle (CUV) at the Geneva Motor Show. The strengths of the four-door Cross Turismo include an emotional design with striking off-road elements as well as an innovative display and operating concept with touchscreen and eye-tracking control. Measuring 4.95 metres in length, the concept vehicle has all-wheel drive and an 800-volt architecture, prepared for connection to the fast charging network. It can also be charged by induction, at a charging station or using the Porsche home energy storage system. Additionally, the debut of the Porsche 911 GT3 RS heralds the arrival of one of the most radical high-performance sports cars today. It produces 383 kW (520 hp) from a four-litre capacity. Two permanent magnet synchronous motors (PSM) with a system output of more than 600 hp (440 kW) allow the Mission E Cross Turismo to accelerate to 100 km/h in less than 3.5 seconds and to reach a speed of 200 km/h in under 12 seconds. Furthermore, the level of continuous power is unmatched by any other electric vehicle: multiple accelerations are possible in direct succession without loss of performance. ‘The Mission E Cross Turismo is an expression of how we envision the all-electric future. It combines sportiness and everyday practicality in unique style. Our vehicle will be fast to drive, but also quick to recharge and able to replicate its performance time after time,’ says Oliver Blume, CEO of Porsche AG. 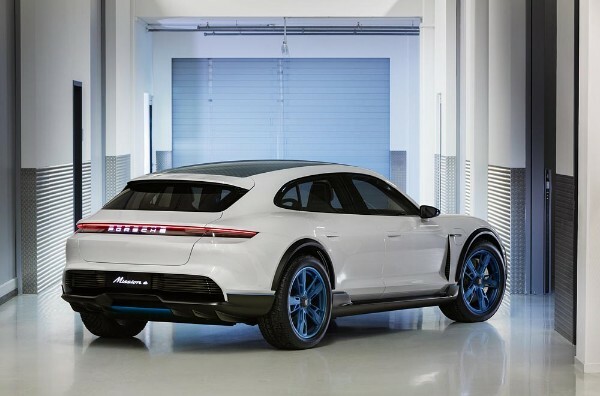 The Mission E Cross Turismo, which is already fit for the road, builds on the concept of the Mission E study presented by Porsche at the 2015 International Motor Show (IAA). The series-produced car based on this model will celebrate its premiere next year. With the 911 GT3 RS, Porsche will also be presenting it’s most powerful road-going track sports car with a naturally aspirated engine. The power of 383 kW (520 hp) is generated by a six-cylinder boxer engine with a four-litre capacity and a revving range of up to 9,000 rpm. Just like the heart of the new GT model, the chassis comes directly from the world of motor sport upgraded with rear-axle steering, all geared towards uncompromising precision. The 911 GT3 RS can accelerate from zero to 100 km/h in 3.2 seconds, reaching a top speed of 312 km/h (194 mph). The Swiss distribution company of Porsche, based in Rotkreuz, supplied 3,621 vehicles last year. In particular, models with the highest performance engines in individual series were in demand, including the decidedly sporty 911 Carrera 4 GTS as a coupé and convertible as well as the 911 GT3. The most popular Porsche car in Switzerland is the Macan GTS. In the gran turismo segment, Porsche scored highly for its performance-oriented hybrid technology.